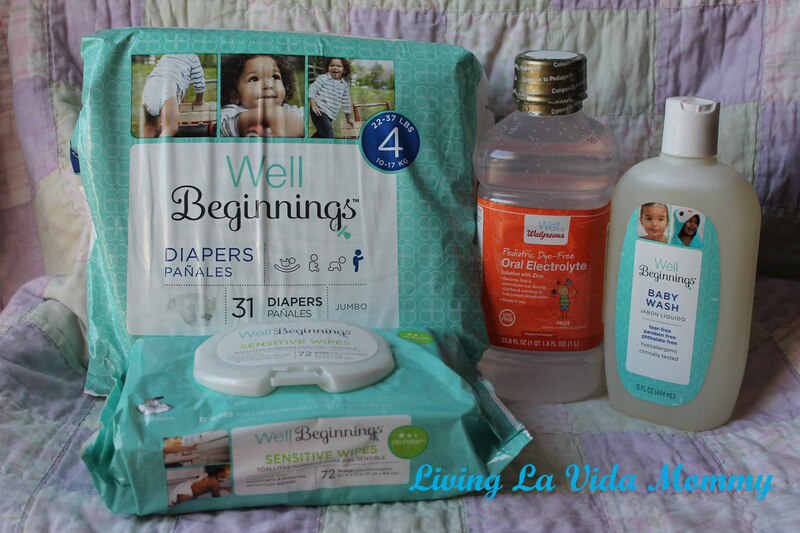 Walgreens Well Beginnings Products Review! As a mom, we are always out on the hunt, looking for the best deals and products for our families, and that is never more true than when searching for wellness items, like diapers, wipes, and other nursery staples for our precious little ones! Luckily for us, these items are easily found nearby, at your friendly neighborhood Walgreens store! Have you seen the awesome Walgreens Well Beginnings Product line yet? If not, be ready to be wowed and stop your search for convenience and quality just a short drive away, no more hunting, the search is over! Diapers, wipes, baby wash, electrolyte solution, Walgreens Well Beginnings line has got you covered for all of your growing baby’s ages and stages. The diapers have super soft elastic waist and side panels, making for a super comfy fit for baby, and you can count on the plush inner liner, which features natural botanicals like vitamin E and aloe, for soothing baby’s bottom. Diaper sizes range from newborn to size 6, and they are truly a steal, compared to the big name brand prices! The sensitive wipes are made from a unique 3 layer fabric, specially designed with two quilted layers for superior cleansing on baby’s skin, but also strength, not tearing and leaving you with messy hands. They are also hypoallergenic, alcohol free and dermatologist approved, not to mention, another great steal, compared to the big name brands! Well Beginnings baby wash is 100% soap free, dye free and ph balanced. It is gentle and safe to use all over your baby’s sensitive skin, and won’t dry out or cause tears. It is also 100% paraben and phthalate free! Definitely an amazing deal and a no brainer, when it comes to washing and protecting baby’s skin! The Electrolyte solution is something that every mama should have on hand because when you need it, you won’t want to be without it! This is such a great bargain compared to the big name brand, and it works just as well! Now that the kids are all heading back to school, you can bet that all of the nasty little bugs and viruses will be coming home with them. Little ones are especially prone to picking up these yucky bugs and they tend to dehydrate very easily with the tummy bugs. Having electrolyte solution on hand, and especially dye free, is an amazing tool to helping your baby feel better soon! Best of all, all of these items and more are all available at Walgreens, your trusted one stop shop, and all are made in the USA! Check out the extensive line of Well Beginnings products on Walgreens website by clicking HERE. “Like” Walgreens and stay up to date with their amazing brand on Facebook by clicking HERE. Follow Walgreens on Twitter by clicking HERE. Check out more amazing products, reviews, advice, etc, by heading over to Moms Meet. Click HERE. I received this product for free from the sponsor of the Moms Meet program, May Media Group LLC, who received it directly from the manufacturer. As a Moms Meets blogger, I agreed to use this product and post my opinon on my blog. My opinions do not necessarily reflect the opinions of May Media Group LLC or the manufacturer of the product.